After creating a pair of gorgeous tribute books for Street Fighter and Darkstalkers, it's finally time for the Blue Bomber to shine. Udon Publishing has started compiling Mega Man Tribute, and they want your fan art. In 2008 Udon released Street Fighter Tribute, a wonderful collection of Street Fighter artwork featuring pieces from professional artists and fans from all over the world. Last year they followed that up with Darkstalkers Tribute, an even prettier volume that I couldn't resist picking up at the San Diego Comic-Con. 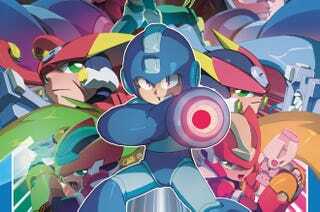 Now they've turned their attentions to Capcom's Mega Man series, and the call for original artwork has gone out. Artists have until Monday, January 31 to submit paintings, drawings, sculptures, or digital art featuring characters from almost any Mega Man series (Battle Network and Star Force are excluded for legal reasons). Just keep it clean and keep is cross-over free and your art could be featured in the book when it goes on sale at the 2011 San Diego Comic-Con. Winners will also get a free copy of the book. Check out the Mega Man Tribute web page for information and rules on submitting artwork. Those of you without artistic talent can oogle the book's cover art instead.